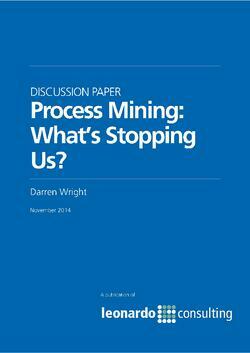 Download "Process Mining: What’s Stopping Us?" Process mining shows great promise to help improve process discovery, measurement and auditing, but Australian enterprises have been slow to take it up. This article explores process mining and discusses its benefits before asking readers to identify what’s holding them back from using it. What does process mining do? What sort of processes can we mine? Benefits of process mining for business. Download the discussion paper today.